Polyair/Water is a rubberized thermoplastic (PVC) hose made from high quality materials that make this hose look and feel like a rubber hose. It is typically lower in cost and lighter in weight than rubber hose, but is not suitable for the same range of temperatures or highly abusive environments. 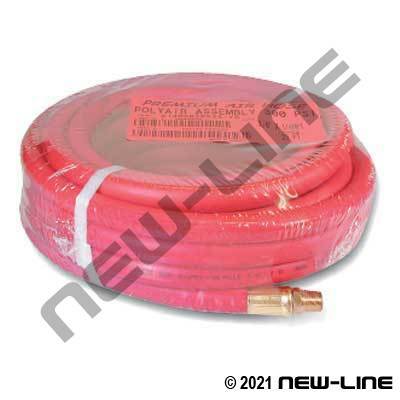 We offer this hose in red (NL1405) and blue (NL1406). The red is commonly used with nailers or as a shop air tool hose, while the blue is commonly used as a high quality, attractive garden hose (not food grade). Polyair can also be used for lubricating oils or low pressure agricultural chemical spray. It is lightweight, non-marking, and resistant to regular abrasion, oil (Class B), weathering, and ozone. Its unique composition allows it to be easily dragged. Typical Fittings: N400/N400L Brass barbs, garden hose fittings, brass ferrules, pinch clamps. N511/512/N400L/N176 Long barbs/Ferrules for larger sizes at higher temps/pressures. Construction: Tube: Black, smooth PVC compound. Cover: Smooth PVC compound. Reinforcement: Polyester yarn. Detail Comments: Popular assemblies are commonly stocked in red (A1405). All coils are neatly coiled and packaged for retail display. The most common ends are crimped on brass male NPT, but we have also listed the reusable screw-type ends with steel spring guards. Please see our water hose section for information on garden hose assemblies.